It has taken ASUS quite awhile to bring its answer to NETGEAR's R8000 X6 Nighthawk and Linksys' EA9200 Tri-Band Smart Wi-Fi Router AC3200 class routers to market. But it's finally here, so let's see if the wait for ASUS fans has been worth it. Like other AC3200 routers, the RT-AC3200 uses Broadcom's XStream "tri-band" architecture. Deep-dive AC3200 technical details are in MU-MIMO vs. XStream: The Coming Battle For Wi-Fi Airtime. But the short story is AC3200's key feature is its potential to squeeze higher total throughput out of multiple 5 GHz devices. XStream doesn't bring range improvement to the party and maximum link rates are the same as AC1900 class, i.e. 600 Mbps in 2.4 GHz and 1300 Mbps in 5 GHz (with devices that support those rates, of course). 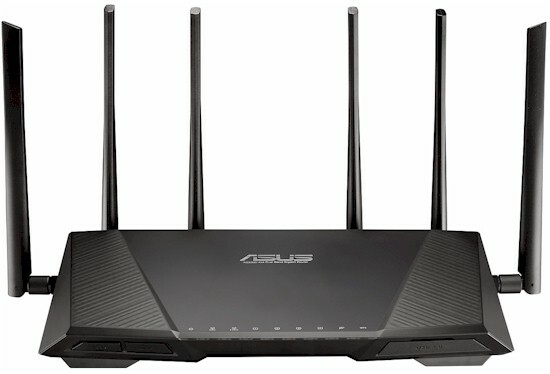 You might mistake the AC3200 for ASUS' RT-AC87U 4x4 router. In fact, the AC3200 looks virtually identical to the AC87U with two extra antennas tacked onto the left and right back corners. The photo below shows the AC87 has significantly fewer cooling vents than the AC3200. There are no vents on the router top cover, only on the bottom and sides. Note the two mounting screw slots at the bottom of the photo. This puts the back panel connectors toward the ceiling if you choose to wall-mount it. Note also that the AC3200's back ridge and front feet are taller than the AC87's —about a quarter inch by my measure —raising the router's bottom higher for better air intake. ASUS kept the soft blue LED placement and the front panel's undercut styling from the AC87. Unless the router is sitting above you, you'll find yourself picking it up to clearly see the lights or operate the LED and Wi-Fi on/off switches. The tiny Wi-Fi Protected Setup (WPS) switch is again on the back panel. All Ethernet ports are Gigabit and there's a USB 2.0 port on the back and awkwardly placed and easy-to-miss USB 3.0 port on the front under a tethered-rubber flap. ASUS' FCC confidentiality request doesn't expire until late May and no one else has posted internal pictures yet, so I'll have to open it up for a look at some point. Not that there is much mystery about what I'll find inside, since all AC3200 class products use the same basic Broadcom Xstream architecture. The expected key component list is in Table 1. Popping open the AC3200 reveals two bi-level heatsinks perched atop the 2.4 GHz / 5 GHz-1 radio on the left and CPU and 5 GHz-2 radio on the right. Note the antenna connections if you like to play with antennas to try to optimize performance. Removing the heatsinks and prying off the RF can tops reveals the view below. The key components are the same as in all other AC3200 routers to date and summarized in Table 1. I was finally able to eyeball the exact 2.4 and 5 GHz power amplifiers used in the RT-AC3200 and I think it's a safe bet they're the same in the Linksys EA9200 and NETGEAR R8000. The flash device must be on the bottom of the board, so the 128 MB is a guess, based on the AC3200 designs. The PLX PEX8603 PCIe switch must get fairly toasty; it had a heatsink below it on the other side of the board that can be seen through the case slots.